Not climate change, not the growing gap between the filthy rich and the deserving poor, and not our crumbling roads, declining schools, or tattered justice system – just Hillary’s emails. The Debate Dividing the GOP, an OtherWords cartoon by Khalil Bendib. Hardly – I misspoke before. The emails aren’t the only thing Republicans talk about. There’s also Benghazi. That was 16 months and $4 million ago. 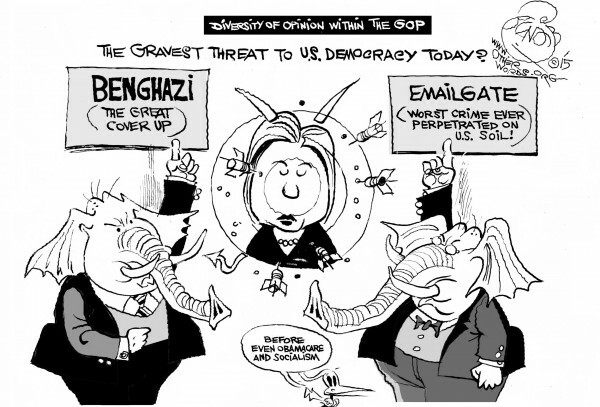 Now they’ve discovered that some of Hillary’s emails mentioned – you guessed it – Benghazi. That means more hearings on the way. That’s it, then. Hillary Clinton’s emails, Benghazi, and Planned Parenthood. Solve those and all our troubles are over. At this point, the GOP campaign for president is the World Wrestling Federation in Gucci shoes.